The Gardener ashes casket is designed to hold the full ashes of an adult. It may also be ordered personalised to your loved one, this can include names, dates, nicknames or photographs and an inscription. 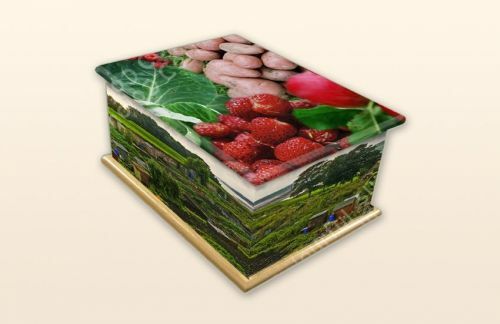 The casket is made from Paulownia Wood and then the design is wrapped around the casket. Please ensure you check all spellings and dates on the inscription you provide as the studio will complete your order exactly to your specification. Alternatively for an extra charge and peace a of mind a proof of the casket can be emailed to you for approval prior to manufacturer. Should you wish to include photographs or inscription please email these to hannah@urns-coffins-caskets.com and choose the correct options above.